Amusement-park operator SeaWorld Entertainmentwill end killer-whale shows at its San Diego property following public scrutiny and regulatory pressure. “We’re not limited to any one animal, to any one show, to any one attraction," SeaWorld CEO Joel Manby told investors in an event that was live-streamed online. 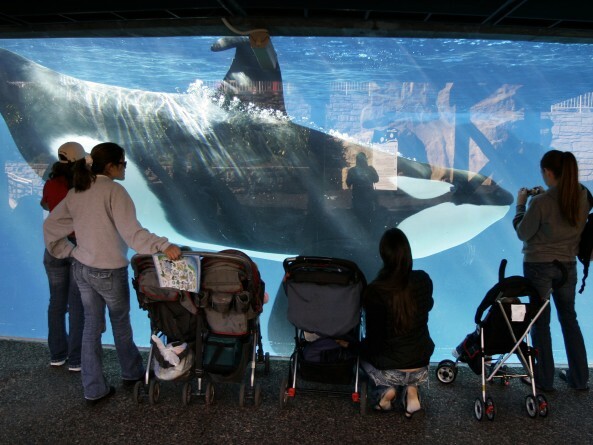 "We are listening to our guests, we're evolving as a company, we're always changing,"
The California Coastal Commission recently refused to give the company permission to breed killer whales, a decision that would have threatened its theatrical shows. The company is putting a hold on a plan for a major tank expansion in San Diego, saying it will invest in a new "orca experience" to open in 2017. San Diego park visitors "want experiences that are more natural," Manby said. "So we actually think it’s a good thing because our guests will resonate with it more. The theatrical production of the show in that market is what they wanted to see less of." Manby said the company would continue killer-whale shows in San Antonio and Orlando. SeaWorld's stock (SEAS) was flat in late-afternoon trading at $18.14. SeaWorld has suffered in the wake of the 2013 documentary Blackfish, which raised questions about the treatment of orcas and their interactions with trainers at the company's parks. The company has turned to discounts to juice attendance and a marketing campaign to restore its image, which has suffered heavy setbacks — particularly in California. Still, per-capita admissions revenue fell by 2.1% through the first nine months of the year to $37.64, primarily reflecting the cost of promotions. "They are finally understanding that their current 'business model' might be the real problem, not necessarily the orca shows," said Bernhard Schroeder, director of the Lavin Entrepreneurship Center Programs at the San Diego State University College of Business Administration, in an email. The challenge, Schroeder said, is to appeal to Millennials who prioritize environmental sensibility and social causes. SeaWorld Entertainment operates 11 parks in five states, including Busch Gardens and SeaWorld. The company's revenue through the first nine months of 2015 fell 1% to $1.1 billion, while net income fell 20% to $60.2 million. Manby told investors that he's focused on instituting "financial discipline," bragging about the company's brand and encouraging visitors to get involved in conservation. "Clearly we’ve had challenges the last couple of years, but in perspective we’ve had a very, very strong track record," said Manby, who joined the company earlier this year. With 22 million guests coming through the door annually, SeaWorld must focus on "touching their heart so we can teach their mind," Manby said. He said SeaWorld is considering building a hotel at its Orlando property, which will also get a new shark-themed roller coaster in 2016. Jill Kermes, senior corporate affairs officer, said a marketing campaign has had a positive impact on the company's image. "The issue is we need to break through the noise. We need to get the information flow to a net positive," she said.